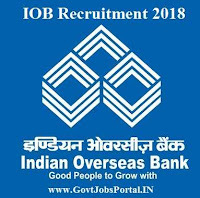 There is new bank jobs notification out from Indian Overseas Bank (IOB) to recruit Indian candidates for vacant positions. IOB is the leading Public Sector Bank in India, having various branches all over India. The headquarters of this Bank is in Chennai city. 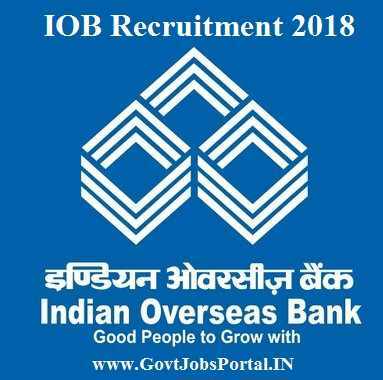 Indian Overseas Bank Recruitment department is inviting all Indian candidates to apply for this recruitment process through online channel. There are total 20 vacant positions for various job profiles which are going to filling up through this recruitment process. Bank will recruit candidates for Specialist Officers posts under Information Security and Information System Audit in MMG Scale II & MMG Scale III. More information related to these bank jobs in India is given below in this article, read the whole article carefully before applying this Indian overseas Bank recruitment process. Education Qualification: All Engineering (BE/B.Tech) candidates can apply for these Government jobs under banking sector. What is the Application Fee for applying this IOB Recruitment? Those who belong to the unreserved category that means General category have to pay the application fee of Rs. 500/-, while all reserved category candidates have to pay Rs. 100/- (Reserved Category: SC/ST/PWD candidates). You can pay the application fee through online channel. Those who are looking for bank jobs in India under Government sector can apply for this IOB recruitment process through online channel. There is no other way to apply for this Bank recruitment process. Candidates can apply online from 21st July 2018 to 04th Aug. 2018. Disclaimer: This information is official posted on the following website: “https://www.iob.in/1Careers1”. We took all detail from this website only. 21ST July 2018 is the Starting Date to apply. 04th Aug. 2018 is the Last Date to apply.